Planning your wedding will be one of your most treasured memories in years to come, but, whilst in the actual process of planning, it’s definitely not always a piece of cake! There are so many important decisions to be made that sometimes choosing the right baker to create your wedding cake can take a back seat to dress fittings and other matters that need your attention. By following a few helpful tips, you can reduce your level of stress a bit, and be sure to get the cake of your dreams. Do a bit of research and attempt to narrow down the style, shape and flavour of wedding cake you have in mind, before looking for a baker. Going forward from the beginning already knowing what you desire will help streamline the process and will also help to identify a baker who is familiar with the type of cake you want. 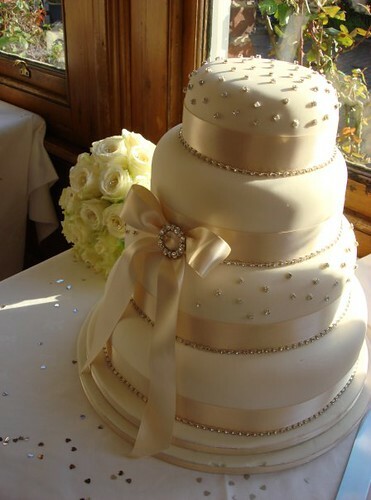 Determine which bakers in your area specialise in wedding cakes and rather than just dropping into the shoppe, call in for an appointment. By letting them know ahead of time that you’re meeting with bakers for your upcoming wedding, they can be prepared to share samples, and most all bakers also have portfolios of their previous work for you to peruse. Once at your meeting with the baker, do pay close attention to their portfolio. Ask a lot of questions, and don’t be timid. One of the most important things to learn is if the head baker really does all of the work, or if they regularly delegate work to assistants. This might not seem like a “sticking point” but, if you think about it, you don’t want a novice practising their trade on your wedding cake. Other questions to ask include: what sort of cake they prefer to bake, what do they consider their speciality and are they willing to try new things, and also enquire about what guarantees are offered and if they deliver. Finally, keep in mind that bakers are craft artisans who express themselves through their work, and take a great deal of pride in their creations. When you find the right baker for you, don’t hold back on the words of praise. Let them know exactly why you love their work and how much you’re looking forward to seeing your dream cake made a reality.